Leeks look like large scallions and have a mild, onion-like flavor. Leeks are firm when raw and are often steamed or included as part of a main dish. One cup of leeks contains about 50 calories and 13 grams of carbs, 1.6 grams of fiber and 3.5 grams of sugar. Leeks are a good source of Vitamin A and Vitamin C and also contain iron. This area features recipes that include leek as an ingredient and provide nutritional information for easier meal planning for diabetes and diets. A simple, but elegant, weeknight meal. Serving size is 3 oz cod, 1-1/2 cup broth and vegetables. 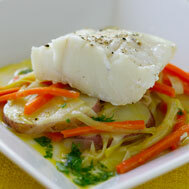 Recipe for Braised Cod With Leeks from our Main Dishes recipe section.